easy to find the location just next to the gate 7 inceon airport terminal 1, easy to use, just need 100.000W deposit using credit card. the battery quite long to use, even we use it for 4 devices. You'll be able to stay connected with your family and friends wherever you are in South Korea with this 4G WiFi device that you can pick up at a number of international airports in Korea. With a data allowance of 1GB per day, you'll be able to check into social media, go through maps to find your way, send and receive emails, and more. You can stay connected no matter where you are, and up to five devices can stay connected. 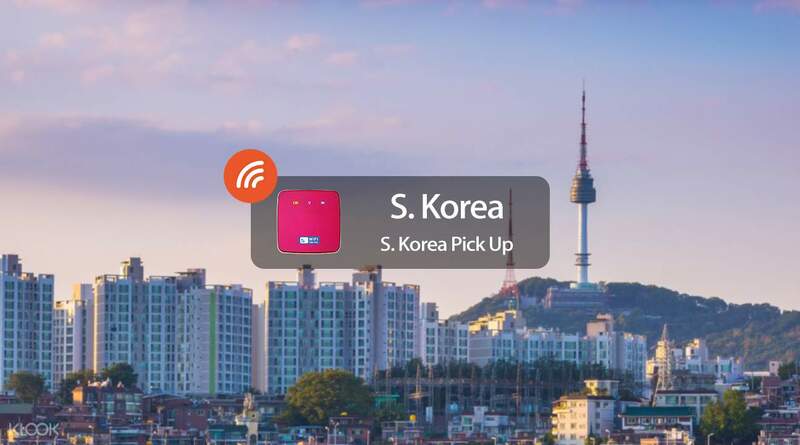 A convenient pick up and drop off for the device is available at many international airports in South Korea, so you can pick up your device right as you arrive and drop it off before you leave, making sure that you can always be connected wherever you go. The device was easy to redeem. You need to show the credit card you used in booking because there’s a deposit of 100,000KRW just in case you lost the device or you broke it. But if you return it without any damages, you’ll get your refund. The device is so fast and I can use it anywhere around Seoul. Even if 2-5 connections are made, the wifi was still as fast as ever. I would definitely recommend this and book this again. Thank you KLOOK! The device was easy to redeem. You need to show the credit card you used in booking because there’s a deposit of 100,000KRW just in case you lost the device or you broke it. But if you return it without any damages, you’ll get your refund. The device is so fast and I can use it anywhere around Seoul. Even if 2-5 connections are made, the wifi was still as fast as ever. I would definitely recommend this and book this again. Thank you KLOOK! Rental of the wifi device was very convenient and the best thing is I got a good deal at a low rate through availing it in klook. It was very convenient to have the device, I did enjoy my travel in South Korea and worry-free as well as I have access to unlimited and fast internet connection which able me to search and reach places. Rental of the wifi device was very convenient and the best thing is I got a good deal at a low rate through availing it in klook. It was very convenient to have the device, I did enjoy my travel in South Korea and worry-free as well as I have access to unlimited and fast internet connection which able me to search and reach places. Our lady guide was so accommodating and friendly. We missed the shuttle bus because we got the wrong pickup point but she still waited for us at the front of everland. We are only 2, and they still confirmed our reservation even if they said there must be a minimum of 4. Sadly we forgot to ask her name because we need to maximize the remaining time. Anyway, thank you Ms.! Our lady guide was so accommodating and friendly. We missed the shuttle bus because we got the wrong pickup point but she still waited for us at the front of everland. We are only 2, and they still confirmed our reservation even if they said there must be a minimum of 4. Sadly we forgot to ask her name because we need to maximize the remaining time. Anyway, thank you Ms.! a must have when travelling and want to update your family and friends online. i always book wifi via klook. im just waiting for the deposit to be returned/refund via my Credit Card. a must have when travelling and want to update your family and friends online. i always book wifi via klook. im just waiting for the deposit to be returned/refund via my Credit Card. Airport pickup and return is hassle free. Connection is fast and wifi battery is also good. Affordable price for the speed and convenience. Thanks Klook! Airport pickup and return is hassle free. Connection is fast and wifi battery is also good. Affordable price for the speed and convenience. Thanks Klook! Very fast and reliable connection in Seoul, Busan and while in transit back and forth. Also, doesn’t take too long to charge and lasted a day with me with 3-4 devices. Thank you! Very fast and reliable connection in Seoul, Busan and while in transit back and forth. Also, doesn’t take too long to charge and lasted a day with me with 3-4 devices. Thank you! Easy to used, very reliable speed & long hours standby!! Very helpful to any travelers! I will recommend to my friends! Easy to used, very reliable speed & long hours standby!! Very helpful to any travelers! I will recommend to my friends! Hassle free collection of the portable wifi at Incheon Airport 24 hours kiosk. Great reception even when we are in the mountains at ypngpyong ski resort. Unlimited data and we r free to post IG n FB Lives. Hassle free collection of the portable wifi at Incheon Airport 24 hours kiosk. Great reception even when we are in the mountains at ypngpyong ski resort. Unlimited data and we r free to post IG n FB Lives.